Available for a range of vans including Mercedes, Ford, Fiat, Citroen, Peugeot and Volkswagen. Call 01279 411014 or contact us for prices. Wolf Elec designer security systems protect your goods while you get on with the job. The Problem: Your cargo can be stolen from the van by thieves who target vehicles when parked and locked. This is done by vandalising the factory-fitted lock. And it takes only seconds! The Solution: Fit the new Wolf-Bolt system to all the cargo doors. This protects each cargo area door with a 14mm diameter steel bolt. Vandalising the locks will not gain entry to the protected area. Compatible with remote controls to operate the bolts at the press of a button. The kit shown adds Wolf-Bolts to the sliding door and twin rear doors. 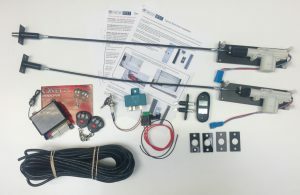 Complete Wolf-Bolt system including the control relays, wiring loom, and all parts required to carry out an installation to the sliding door and rear door of many vans. Each kit is also supplied with a fail-safe key lock. 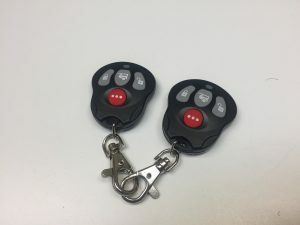 For extra security we recommend using a Wolfelec remote control to operate the bolts, however it is also possible to connect them with your factory central locking system. You may not have remote controls on your van or for security reasons you may wish to control the Wolf-Bolt system separately to central locking. This kit contains all the parts of the WB10 kit plus a sophisticated remote-control system with programmable features and two 'code-hopping' key-ring transmitters. © 2019 Wolf Van Security. All rights reserved.